[163 Pages Report] The artificial intelligence (AI) in agriculture market was valued at USD 432.2 Million in 2016 and is expected to be valued at USD 2,628.5 Million by 2025, at a CAGR of 22.5% during the forecast period. The base year considered for this study is 2016, and the market forecast is provided for the period between 2017 and 2025. The size of the AI in agriculture market has been estimated using both top-down and bottom-up approaches. These approaches have been used to estimate and validate the size of the market and various other dependent submarkets. The key players in the market have been identified through secondary research, and their regional market shares have been determined through primary and secondary research. This research has extensively used secondary sources, directories, and databases (such as Hoovers, Bloomberg Businessweek, Factiva, and OneSource) to identify and collect information useful for this technical, market-oriented, and commercial analysis of the AI in agriculture market. This entire research methodology includes the study of annual and financial reports of the top market players as well as interviews with industry experts, such as chief executive officers (CEOs), vice presidents, directors, and marketing executives, for the key qualitative and quantitative insights on the market. 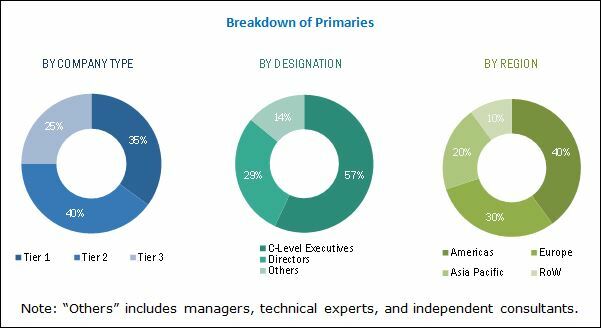 The ecosystem of the AI in agriculture market comprises technology providers, namely IBM (US), John Deere (US), Microsoft (US), Agribotix (US), The Climate Corporation (US), ec2ce (Spain), Descartes Labs (US), Sky Squirrel Technologies (Canada), Mavrx (US), aWhere (US), Gamaya (Switzerland), Precision Hawk (US), Granular (US), Prospera (Israel), Cainthus (US), Spensa Technologies (US), Resson (Canada), FarmBot (US), Connecterra (Netherlands), Vision Robotics (US), Harvest Croo (US), Autonomous Tractor Corporation (US), Trace Genomics (US), Vine Rangers (France), and CropX (Israel). The report also describes drivers, restraints, opportunities, and challenges impacting the growth of the AI in agriculture market. Apart from the in-depth view on the market segmentation, the report also includes the critical market data and qualitative information for each type, along with the qualitative analysis such as value chain analysis, market ranking analysis, competitive situations and trends, and competitive leadership mapping. The report targets the technology providers, software providers, system integrators, and end-user industries in the market. 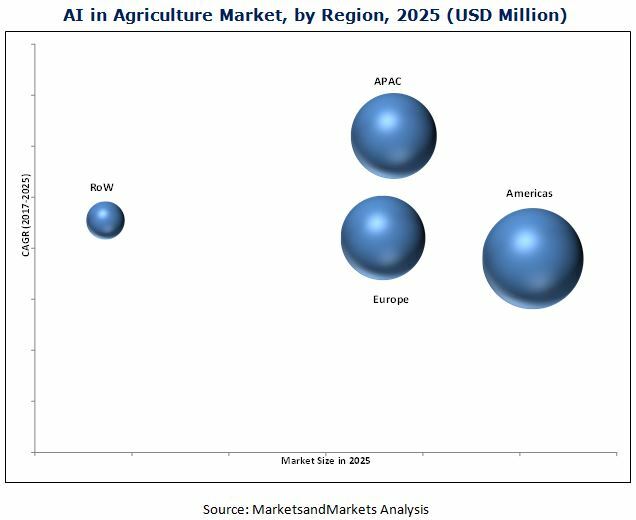 The AI in agriculture market is expected to grow from USD 518.7 Million in 2017 to USD 2,628.5 Million by 2025, at a CAGR of 22.5% between 2017 and 2025. The major factors driving the growth of the market include the growing demand for agricultural production owing to the increasing population, rising adoption of information management systems and new, advanced technologies for improving crop productivity, increasing crop productivity by implementing deep learning techniques, and growing initiatives by worldwide governments supporting the adoption of modern agricultural techniques. The combination of the Internet of Things and artificial intelligence technologies, such as machine learning, computer vision, and predictive analytics, further allow farmers to analyze real-time data of weather conditions, temperature, soil moisture, plant health, and crop prices in the market. The AI in agriculture market report has been segmented on the basis of offering, technology, application, and region. Based on offering, the market has been classified into hardware, software, AI-as-a-Service, and service. The software segment held the largest market size in 2016. The market for the software segment is mainly driven by the integration of mobile technologies with farming techniques, growing use of artificial intelligence software to improve farm efficiency, and rising demand for real-time data management systems. The market for the hardware segment is expected to grow at the highest CAGR during the forecast period. The increasing demand for processors and data storage devices for farm operations is the major factor that is likely to contribute to the high growth rate of the hardware market in the coming years. Based on technology, the AI in agriculture market has been classified into machine learning, computer vision, and predictive analytics. Machine learning held the largest market size owing to the growing adoption of this technology for various applications of agriculture such as precision farming, drone analytics, agriculture robots, and livestock monitoring. Machine learning-enabled solutions are being significantly adopted by agricultural organizations and farmers worldwide to enhance farm productivity and to gain a competitive edge in business operations. Moreover, in the coming years, applications of machine learning for various agricultural activities are expected to rise exponentially. On the basis of application, the market has been segmented into precision farming, livestock monitoring, drone analytics, agriculture robots, and others. Others application include smart greenhouse management, soil management, and fish farming management. The precision farming application held the largest market share in 2016. The application of precision farming is likely to continue to hold the largest market size in the coming years due to the high adoption rate of artificial intelligence technologies for this application. On the basis of region, the AI in agriculture market has been classified into the Americas, Europe, Asia Pacific, and RoW. The market in Asia Pacific is estimated to grow at the highest CAGR during the forecast period. The increasing adoption of deep learning and computer vision technologies for agricultural applications is the major driving factor for the market growth in the APAC region. Farmers in countries such as Australia, China, Japan, and India are increasingly adopting machine learning, deep learning, computer vision, and predictive analytics technologies. A major factor restraining the growth of the AI in agriculture market is the high cost of gathering precise field data. AI technology requires high initial investments, efficient farming tools, and skilled and knowledgeable farmers or growers, among others, thereby making farmers apprehensive to use this technology for gathering precise field data. The climate corporation (a subsidiary of Monsanto) is a digital agriculture company that examines weather, soil, and field data to help farmers to improve farming operations and crop productivity. The company offers the climate field view platform, which helps farmers in increasing productivity with digital tools. The company’s innovative product portfolio includes Field View Platform, Climate Field View Prime, Climate Field View Plus, and Climate Field View Pro Mobile SaaS solutions. These innovative products help farmers in increasing profitability by enabling better informed operating decisions.